Development of the Russian Ka-32 (NATO Designation: 'Helix-C') began in 1980. 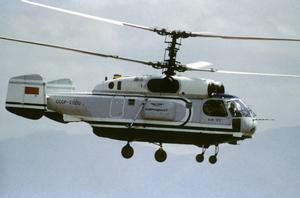 The airframe, powerplant and rotor system are based on the Kamov Ka-27. Specifically, the Ka-32 is a civilian version of the SAR helicopter Ka-27PS. Maximum internal and slung loads are 3700 kg and 5000 kg, respectively. Resources related to the Ka-32 , provided by the Vertical Flight Society. Resources related to the Ka-32 , provided by public sources across the internet.